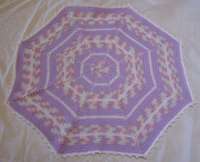 Try creating this octagon baby afghan for a change from the usual shapes. The instructions are so easy and it can be worked in any thickness of yarn - just be aware that the thicker the yarn the larger the afghan - thinner yarn = smaller afghan. Gauge - Double crochet 17sts X 9 rows = 4 inches, gives an afghan 32 inchesacross. I used Bernat Softee Baby Sport Double Knit - one skein each of lilac and white (5oz/140g each) and one skein of pink/lilac/white variegated (4.25oz/120g). Hook size - 4mm, 8 Can, 6/G US. Stitches used in this octagon baby afghan are chain, single crochet, slip stitch anddouble crochet.Also used - picot edging.This pattern is worked in rounds from the same side - no need to turn your work over. *3 rounds A, 3 rounds B, 1 round C.
3 rounds B, 3 rounds A, 1 round C.
Repeat from * until you've finished 34 rounds total, then 1 round C in single crochet and 1 round C in picot edging. Now to the pattern for this octagon baby afghan...Starting with your variegated yarn,chain 4, join with slip stitch to form ring. Ch 4, [2dc into ring, ch1] 7 times, then 1dc, join with sl.st.to ch4. Ch4, 1dc in same ch1 space, [skip next dc, 1dc in next st, (1dc,ch2,1dc) in next ch1 space] 7 times, then skip next st,1dc in next st, join with sl.st. to ch4. Ch5, 1dc in same 2ch space, [1dc in each of next 4sts, (1dc, ch3, 1dc) in next ch3 space, 7 times, 1dc ineach of next 4sts, join with sl.st. to ch5. Ch5, 1dc in same ch3 space, [skip next st, 1dc in each of next 5 sts,(1dc, ch3, 1dc) in next ch3 space] 7 times, skip nextst, 1dc in each of next 5sts, join with sl.st. to ch4. Ch5, 1dc in same 3ch space, [1dc in each of next 7sts, (1dc, ch3, 1dc) in next ch3 space] 7 times, 1dc ineach of next 7sts, join with sl.st. to ch5. Ch5, 1dc in same ch3 space, [skip next st, 1dc in each of next 8 sts,(1dc, ch3, 1dc) in next ch3 space] 7 times, skip nextst, 1dc in each of next 8sts, join with sl.st. to ch4. Ch5, 1dc in same 3ch space, [1dc in each of next 10sts, (1dc, ch3, 1dc) in next ch3 space] 7 times, 1dc ineach of next 10sts, join with sl.st. to ch5. (Single increase round) Ch5, 1dc in same ch3 space, [skip next st, 1dc in each of next 11 sts,(1dc, ch3, 1dc) in next ch3 space] 7 times, skip nextst, 1dc in each of next 11sts, join with sl.st. to ch4. (Double increase round) Ch5, 1dc in same 3ch space, [ 1dc in each of next 13sts, (1dc, ch3, 1dc) in next ch3 space] 7 times, 1dc ineach of next 13sts, join with sl.st. to ch5. NOTE The single increase round skips the first stitch of each sector thereby increasing one stitch per sector and 8 stitches per round.The double increase round works a dc into every stitch in every sector, thereby increasing 2 stitches per sector and 16 stitches per round. Work one more double increase round, then continue as follows...*1 single increase round, 2 double increase rounds, repeat from *until 34 double crochet rounds have been worked. For the last round of this octagon baby afghan, work a picot edging.Start as follows, (picot) ch4, sl. st. to first ch, then sc in each of next 5sts. Continue around edge of afghan as above working a picot onto each point and at the above intervals in between. So - there you have an octagon baby afghan. So pretty in these colors, but this versatile design could so easily be worked for a boy in blues, greens or lemons. It's a great shape for swaddling younger babies, keeping them cozyand comfortable as they sleep. Pop this octagon baby afghan down on the floor as a small play mat for a younger baby. A perfect gift for a new Mom. NEW - Baby car seat sleepsuit pattern - be the first to see it!